Posted on September 22, 2017 by Megan V.
Anyone who has read Lord of the Flies, or seen the Walking Dead television show, knows that when the world comes to an end, people are going to do whatever they can to survive (ie cannibalism, children killing other children). This is the same with The Road- people shouting “You would have done the same!” as they try to steal and murder each other. But wouldn’t it be just nice if even in this dystopian world, everyone was nice to each other? An unnamed father and son travel down a road to the sea and try to survive amid the thieves and not knowing who to trust. We don’t fully know what caused the world to be like this- earthquake? extremely hot temperatures? But we do know that rations are limited and they must keep traveling in order to survive. The father always seems to try to resort to a dark side- giving up food for his son, trying to kill everyone who crosses them- but the son keeps him on the road- noticing when the father tries to give the son bigger portions, begging the father not to kill anyone. All in all, it is a very pleasant story to read, especially since it gives a theme that man will not fully go down the evil side even when there is no hope. However, there are a few writing styles that will turn a few people down. First of all, there are not quotation marks- whenever the character speaks it is either its own separate paragraph or embedded in another paragraph, which makes the reader go back a couple of times in order to figure out who is talking. Additionally, most of the book is written in camera style- the story’s plot moving along because of dialogue, not because of what they thought. This narration is often considered boring by some readers. However, the story is beautifully written to me, with a compelling message and a heartfelt plot. It is also a quick read compared to some other books. For those who are looking for a twist on the dystopian genre, it is a worthwhile read. 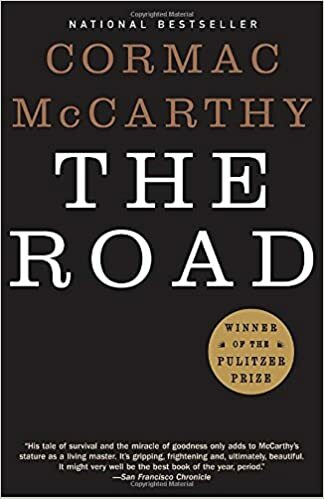 The Road By Cormac McCarthy is available for checkout from the Mission Viejo Library. This entry was posted in Book Reviews and tagged Cormac McCarthy, dystopian, horror, science fiction, The road by Megan V.. Bookmark the permalink.